April 10, 2019 – Our paper identifying overlapping functions of Chlamydomonas actins was just accepted for publication to Cell Reports! Congrats to first author Brittany and all the co-authors!! February 27, 2019 – We posted another preprint! RanGTP regulates cilium formation and ciliary trafficking of a kinesin-II subunit independent of its nuclear functions is now available. Congrats to Shengping. Here’s the story behind the story. February 26, 2019 – Evan just got accepted to the Interdisciplinary Graduate Program in Biomedical Sciences (IGPBS) here at KUMC and at the Biology Department graduate program at the University of Washington in Seattle! Congrats Evan! February 18, 2019 – We posted our latest preprint! The elusive actin cytoskeleton of a green alga expressing both conventional and divergent actins is now available. Congrats to Evan and thanks to Miroslava Schaffer and Ben Engel for their awesome tomograms and help on this paper! Here’s the story behind the story. January 11, 2019 – Evan just secured a position as a course assistant for the legendary Woods Hole Physiology course this summer! Congrats Evan!! January 7, 2019 – IGPBS students Steffie Villanueva and Larissa Dougherty start their rotations in the lab. Welcome Steffie and Larissa! January 7, 2019 – Research assistant Osama Ehtesham starts in the lab. Welcome Osama!! January 4, 2019 – Postdoc Shengping Huang received a Biomedical Research Training Program postdoctoral fellowship! Congrats Shengping!! December 8-12, 2018 – The Avasthi Lab attended the 2018 American Society for Cell Biology annual meeting in San Diego, CA. Prachee presented a talk in the Evolutionary Cell Biology member organized subgroup. Brittany, Brae, Evan, and Shengping all presented posters on their latest work. Prachee also participated in a panel on Social Media for Science Communication with Beth Kenkel (Research Scientist, University of Washington) and Needhi Bhalla (Associate Professor, University of California Santa Cruz). December 5, 2018 – Prachee was selected to join the Journal of Cell Biology’s inaugural Early Career Advisory Board! December 3, 2018 – Our preprint, “Partially redundant actin genes in Chlamydomonas control flagellum-directed traffic and transition zone organization” (first author: 2nd year grad student Brittany Jack) was revised on BioRxiv and now includes beautiful new EM data! December 3, 2018 – Prachee’s spotlight article “Can microtubule motors use every available track?” discussing Bertiaux et al., 2018 was published in the Journal of Cell Biology. December 1, 2018 – Prachee was featured in The Scientist’s Scientist to Watch series. October 17, 2018 – Prachee visits eLife offices and speaks to postdocs/students at Cambridge University, UK about the role of early career researchers in changing the culture of scholarly communication. October 15, 2018 – IGPBS students Ananya Srinivasa, Jenna Frick, and Kristen Schwingen start their rotations in the lab. Welcome all! September 5-7, 2018 – Prachee hosts Josh Bembenek from the University of Tennessee Knoxville for the Anatomy & Cell Biology Seminar Series. Welcome to Kansas City, Josh! August 24, 2018 — It’s official! We’ve received our Notice of Award for our NIGMS R35! We’re recruiting – join us! August 12-17, 2018 – Prachee, Evan, and Brittany attended the Plant and Microbial Cytoskeleton Gordon Research Conference in Andover, NH. Prachee lead a session on Cellular Signaling and Morphogenesis, Brittany gave a short talk, and both Evan and Brittany presented posters! July 27, 2018 – Rotation student Brae Bigge has concluded her rotations and decided to join our lab! Welcome Brae! July 9, 2018 – IGPBS student Wendena Parkes starts her summer rotation in the lab. Welcome Wendena! June 19, 2018 – Prachee’s NIGMS R35 (MIRA) application is getting funded for 5 years! This grant is to study novel mechanisms of ciliary regulation. We’ll be keeping an eye out for new lab members. If interested, please apply! Congrats to the whole lab for all their efforts that went into this! June 18, 2018 – Brittany and Brae’s (and Rosalyn’s) Grad Slack was featured in a Science Careers article! June 11, 2018 – Prachee’s eLife piece (with Alice Soragni and Josh Bembenek) on utilizing preprint journal clubs in graduate education is out today! May 31, 2018 – Our methods chapter is out today in Plant Chemical Genomics in the Methods in Molecular Biology Series! We celebrated with Chinese food! May 29, 2018 – Brittany, Brae, and their classmate Rosalyn started the Slack group for grad students! May 29, 2018 – Joseph Stautner, undergraduate from Springhill College, joins the lab as a K-INBRE summer scholar! Welcome Joseph! May 21, 2018 – Brae Bigge joins the Avasthi Lab as a summer rotation student! Welcome Brae!! May 9-11, 2018 – Prachee hosts Dave Sept from the University of Michigan for the Anatomy & Cell Biology Seminar Series. Welcome to Kansas City, Dave! May 1, 2018 – Prachee is giving a talk in the Pharmacology and Toxicology Department Seminar Series at KUMC. April 16, 2018 – Prachee is giving a talk in the Biology Department at Wichita State University (hosted by Moriah Beck). April 14, 2018 — Prachee is giving a speech on the thrill of basic science discovery at the Kansas City March for Science! April 13, 2018 – Daniel Kohl, undergraduate from Rockhurst university, joins the lab! Welcome Daniel!! March 30, 2018 — Postdoc Shengping Huang received a K-INBRE postdoctoral award! Congrats Shengping!! March 21, 2018 – Prachee is giving a science + career talk in an NSF funded professional development seminar series organized by the Biochemistry & Cell and Molecular Biology Department at the University of Tennessee, Knoxville (hosted by Maitreyi Das). March 8, 2018 – Prachee hosts Mary Munson from the University of Massachusetts Medical School for the Anatomy & Cell Biology Seminar Series. Welcome to Kansas City, Mary! February 7-9, 2018 – Prachee is attending a meeting on Transparency, Reward, and Innovation in Peer Review in the Life Sciences at HHMI, Chevy Chase MD. February 6, 2018 – Prachee is featured on the KUMC website for her recent appointment to the eLife Board! January 11, 2018 – Prachee hosts Moriah Beck from the Wichita State University for the Anatomy and Cell Biology Seminar Series. Welcome back to Kansas City, Moriah! January 1, 2018 – Prachee joins the Board of Directors of ASAPbio! December, 2017 – Prachee becomes the first early career researcher to be appointed to the eLife Board of Directors! December 2-6, 2017 – The Avasthi Lab is going to the American Society for Cell Biology annual meeting! See you in Philadelphia! November 30, 2017 – We posted our third preprint! November 8-9, 2017 – Prachee is attending the eLife Early Career Advisory Group Annual Meeting at the Broad Institute, Cambridge MA. October 9, 2017 – Prachee is giving a talk in the Department of Systems Pharmacology and Translational Therapeutics Seminar Series at the University of Pennsylvania (hosted by Casey Greene). September 7, 2017 – Prachee is hosting Bob Keenan from the University of Chicago for the Anatomy & Cell Biology Seminar Series. Welcome to Kansas City, Bob! August 4, 2017 – Gabrielle Witter, KINBRE summer scholar, gives her end of summer talk and heads back to Springhill College. Thanks for spending the summer with us Gabrielle! July 31, 2017 – Evan Craig, recent graduate of Rockhurst University, joins the lab! Welcome Evan! 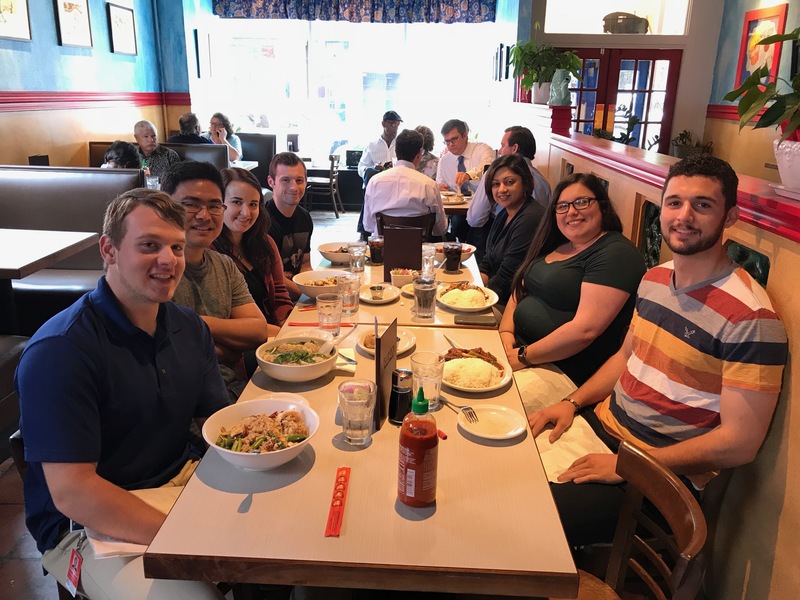 July 28 , 2017 – The Avasthi Lab says farewell to David Mueller, who is starting medical school at Boston University. Congrats and good luck David! July 16-21, 2017 – Prachee and Brittany head to Scottsdale, AZ for The Biology of Cilia and Flagella FASEB meeting, where Brittany will present a poster on actin redundancy in flagellar protein trafficking. July 10, 2017 – Prachee was selected to be on eLife’s Early Career Advisory Group! June 9, 2017 – Prachee is giving a talk in the Central Regional IDeA Meeting in Sioux Falls, SD. May 30, 2017 – We’re looking for a new research assistant! See more information on the Join Us page. Update: position filled! May 15, 2017 – K-INBRE summer scholar Gabrielle Witter joins the lab. Welcome Gabrielle! May 11, 2017 – Prachee is hosting Casey Greene from the Perelman School of Medicine at the University of Pennsylvania for the Anatomy & Cell Biology Seminar Series. Welcome to Kansas City, Casey! March 28, 2017 – The Avasthi Lab participated in the Teachers and Students for Community-Oriented Research and Education (T-SCORE) program to increase numbers of underrepresented minority high school students entering the health sciences. The lab gave a tour to students from Kansas City, KS high schools and Prachee participated in a career panel. March 23, 2017 – Rockhurst student Taylor Kersten joins the lab. Welcome Taylor! March 22, 2017 – Prachee gave a talk in the KUMC Cancer Center Seminar Series. March 17, 2017 – Brittany was awarded the prestigious NSF Graduate Research Fellowship! Congrats Brittany!! March 9, 2017 – David was accepted into two more medical programs (Boston University and KUMC)! Congrats David!! March 6, 2017 – Prachee gave a talk in the Molecular & Integrative Physiology Seminar Series at KUMC (hosted by Vargheese Chennathukuzhi). February 27, 2017 – Prachee visited the Biology Department at Washington University in St. Louis to give a seminar (hosted by Petra Levin). February 24, 2017 – David was accepted into the medical school program at the University of Missouri. Congrats David! February 20, 2017 – Brittany was accepted into the KUMC IGPBS graduate program. Congrats Brittany! February 13, 2017 – Soumita’s paper, the first from the Avasthi Lab, was accepted for publication in the ASM journal, mSphere! February 8, 2017 – UMKC medical student Kate Fee joins the lab. Welcome Kate! December 21, 2016 – We posted our second preprint! November 23, 2016 – We posted our first preprint! November 10, 2016 – The Avasthi Lab hosts Wallace Marshall (Professor, UCSF), Prachee’s former postdoctoral advisor, for the Anatomy & Cell Biology Seminar Series. Welcome to Kansas City, Wallace! November 4, 2016 – Prachee gave a talk on preprints to the KUMC postdoctoral association (9am in 2099 HLSIC). October 17, 2016 – Nicole Ellis starts her rotation in the lab! Welcome Nicole! October 12, 2016 – Karla Prats, high school student from the Blue Valley Center for Advanced Professional Studies (BV CAPS) program joins the lab. Welcome Karla! October 3, 2016 – Caleb Trecazzi joins the lab! Welcome Caleb! Prachee is co-chairing a member-organized subgroup with Jessica Polka (Director of ASAPbio, Visiting Scholar at the Whitehead Institute) at the American Society for Cell Biology annual meeting (Saturday afternoon) on the topic of preprints in the life sciences. See the program here! July 20, 2016 – Shengping Huang joins the lab! Welcome Shengping! May 31, 2016 – David Mueller, recent graduate of Boston University joins the lab. Welcome David! May 31, 2016 – Brittany Jack, Undergraduate from Rockhurst University joins the lab. Welcome Brittany! May 17, 2016 – Prachee gave a talk in the Microbiology Molecular Genetics and Immunology Department seminar series at KUMC (hosted by Michael Parmely). April 20, 2016 – Taylan Erdogan and Natalie Harmon, high school students from the Blue Valley Center for Advanced Professional Studies (BV CAPS) program join the lab. Welcome Taylan and Natalie! February 26, 2016 – Rafia Mir receives K-INBRE postdoctoral award! Congrats Rafia! February 12, 2016 – Prachee Avasthi obtains secondary appointment in the Department of Ophthalmology. December 1, 2015 – Rafia Mir joins the lab! Welcome Rafia! November 18, 2015 – Soumita Dutta joins the lab! Welcome Soumita! October 23, 2015 – Prachee gave a talk in the Biochemistry & Molecular Biology Department seminar series at KUMC (hosted by Mark Fisher). October 19, 2015 – Chris Musgrove joins the lab! Welcome Chris! September 2, 2015 – Avasthi Lab doors open! August 10, 2015 – Ashley Tetlow joins the lab! Welcome Ashley!